Almost 20 years ago now, I sat in a darkened comedy club, watching my friend Sharon do a standup routine. I had been at her first open mic, along with her boyfriend at the time (who turned out to be this guy), and our roommate William. They were all three nervous and definitely talented. But Sharon? Sharon was hilarious. She has always made me laugh so hard the inside of my nose hurts. My cheekbones twinge. That woman leaves me helpless with laughter. It amazed me, this line. It seemed so right. What would life be like if we had the zeal and determination of an 8-year-old girl? A couple of weeks ago, I brought a cake to my 8-year-old girl. Lucy turned 8. Eight! And as luck would have it, the visiting Sharon sat at the table, along with Dan and Desmond, all of them singing as I carried a peach and sour cream bundt cake to her. Earlier, on a car ride to dance camp, Lucy told me: “I’d like cake for breakfast on the morning of my birthday, something with fruit, in that round cake tin you use that has the middle part sticking up. And then a double-layer chocolate cake with caramel frosting for my party.” No hesitation. All of it gluten-free, of course. The girl knows what she wants. As I carried the cake to Lucy, she giggled and smiled, this 8-year-old girl. We finished singing, then watched her bend toward the candles, little flames flickering. She puffed out her cheeks, then blew them all out, decisively. And we applauded. Cake for breakfast, everyone. We have an 8-year-old in the house. Watch out. I saw this cake on Smitten Kitchen, just after Deb launched her site’s redesign. (Go, Deb!) She made her 1-year-old a two-layer sheet cake with a bunny-face cake on top, all decorated beautifully. Oh Deb, you make the rest of us look so slapdash in comparison. I knew I didn’t want to make a three-layer cake, especially because this was merely the birthday-morning-breakfast cake for Lucy. So I cut the recipe by 1/3 and used our gluten-free flour in place of the regular AP. That’s all it takes. This cake is moist and sort of dense, in the way I like my cakes to be. The so-fluffy-it-barely-exists birthday cake is not big around here. I like a cake that is sweet but not too sweet, filled with fruit and flavors, and has enough heft to let us know we’re eating cake. One piece of this for breakfast was enough for everyone here. With my dear friend Sharon visiting, there was enough left over for pieces that night, and a few little nibbles for breakfast the next day. We’ll be making this one every summer now. Oh, you can peel the peaches, if you want. We didn’t. No one seemed to mind. Prepare to bake. Grease a bundt pan with butter or oil. (We used a 10 to 15-cup bundt pan and the cake came to about halfway up the pan. 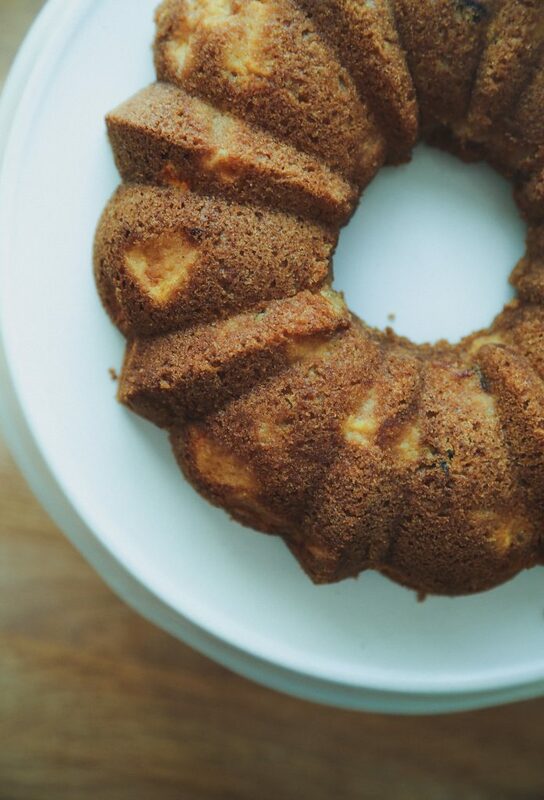 You could probably use a 6-cup bundt pan, if that’s what you have.) Heat the oven to 350°. Combine the dry ingredients. Whisk together the flour, baking powder, soda, and salt in a large bowl. Set aside. Cream the butter and sugar. Put the softened butter into the bowl of a stand mixer fit with the paddle attachment. Turn it on low and add the sugars. When they are well mixed and fluffy, add the eggs, one at a time, with the mixer still running on low. Scrape down the side of the bowl. Add the vanilla and nutmeg and mix. Finish the batter. With the mixer running on low, add 1/3 of the dry ingredients. When the flour has entirely disappeared into the batter, add 1/2 the sour cream. Scrape down the sides of the bowl. Repeat with another 1/3 of the flour, then the remaining sour cream. Finish the batter with the last 1/3 of the dry ingredients. Turn off the mixer and remove the bowl. Add the chopped peaches and very gently stir them into the batter with a rubber spatula. Bake the cake. Pour the batter into the greased bundt pan. Gently tap the bottom of the pan onto the counter to evenly distribute the batter. Bake until the cake is browned and a toothpick inserted into the center comes out clean, 25 to 35 minutes. 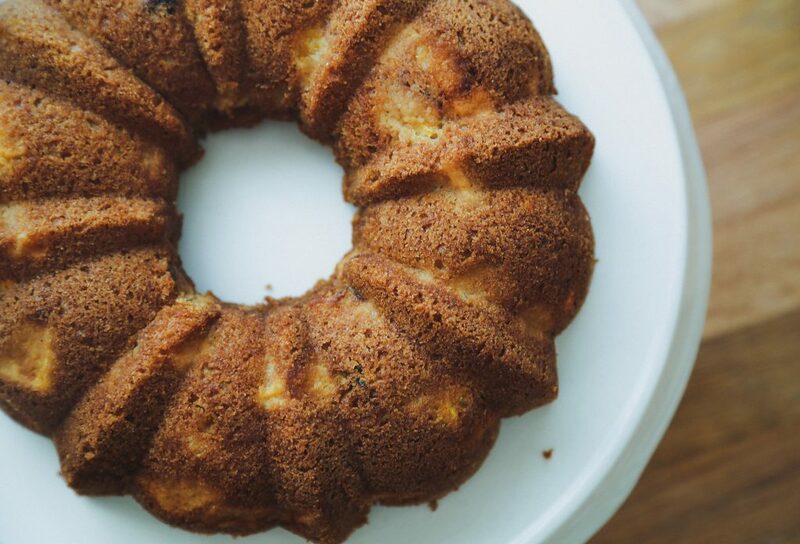 Allow the cake to cool to room temperature in the bundt pan, then turn it out onto a cooling rack. Feel like playing? If you have to be dairy-free, then use shortening instead of butter here. Use a vegan sour cream instead of the traditional sour cream. If you want the cake to be silkier in its texture, not so dense, then use 115 grams of vegetable oil in place of the butter. You could play with all kinds of spices here: cinnamon, clove, Chinese 5-spice. And feel free to sub in any ripe stone fruit you want in place of the peach.